This just in from Shirley a Shaklee Distributor..
Today I went in for my yearly hearing aid check up at the audiologist. He said that it has been a number of years since I had a hearing test and this is especially important considering my age. After the tests were completed he compared the results today with the previous tests. He said he didn't understand why the results of today's testing were so out of line with my previous tests. Then he showed me the comparison. He said my tests today showed my hearing to be ABOVE the "normal" line whereas my previous tests showed all my scores to be way BELOW the "normal" range. He said this can't be because no one has ever had this much improvement in their hearing in all the years he has been in this business. He said that something isn't right, no one has this dramatic improvement in hearing and especially considering your age. Then I told him that I felt sure I had the explanation for the improvement - it's Vivix. Then I briefly told him what this product is and the testimonials Shaklee has received of vastly improved health because of this product. That it is so unique Shaklee has applied for patents. I asked him if he'd like for me to drop off information and science about this product. He said "yes". I've gotta comment on this testimonial. 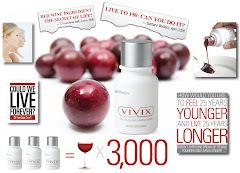 It makes perfect sense to me too knowing that Vivix actually goes into the DNA of the cell and protects and repairs it. There is a reason it's called an anti-aging tonic... Who knows what it could do you for your body.